A massive Buddha statue weighing about half a tonne has been stolen from a temple in the Botswana capital, Gaborone, police say. The Buddhist community in the city say they are devastated by the loss and have appealed for help to retrieve it. 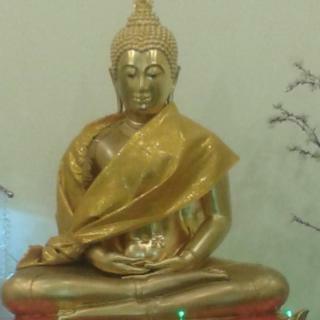 The bronze statue was donated by Thailand in 1996 and is 1.5m (5ft) tall and 1.2m wide. It would require at least eight people to carry it. Local people say the thieves may have thought the statue was made from gold. Botswana Buddhist Association President Darhsini De Silva told the BBC that the statue was worth about $24,500 (£18,600). It was stolen during a break-in at the Gaborone North Buddhist Temple on 3 July, Assistant Police Commissioner Witness Bosija said in a statement. However, Ms De Silva told the BBC that the theft took place on the night of 9 July when the alarm system at the temple was deactivated by thieves. Ms De Silva said that the weight of the statue meant that it was probably taken by a criminal gang. It was brought to the country and blessed by 10 Thai Monks in June 1996. Another Buddha statue at the temple was acquired from Sri Lanka four years earlier. Police say that so far no arrests have been made and investigations are continuing. The local Buddhist community, meanwhile, fears that unless the thieves are caught soon, the statue will be melted down and lost forever. Thefts from places of worship have happened before in Botswana. Last year a statue from the Hindu community temple was stolen. It is not clear if has been recovered. The latest theft comes ahead of a visit to Botswana by the Tibetan spiritual leader, the Dalai Lama, from 17 to 19 August. It will be the spiritual leader's first visit to Africa. China is one of Botswana's largest trading partners and has objected to the visit. But Botswana's Foreign Minister Pelonomi Venson-Moitoi has insisted that her country is a sovereign state and it will decide who should be allowed to visit. South Africa has denied the Dalai Lama permission to enter five times.